Should I Keep My Betta in a Vase? The Peace Lily Vase-Siamese Fighting fish combination has sparked more debate than almost any other aquarium topic. Even though it's been a number of years since the fad was first popular, they are still promoted in some places and have even expanded to other species of fish. The pivotal question is if it’s safe for the fish. What is my stand on the issue? I do not consider a flower vase a healthy environment for a Betta (AKA: Siamese Fighting fish), or any other species of fish, for a number of reasons. The primary argument made for keeping a Betta in a vase is that pumps, filters, and other aquarium equipment, do not exist in nature. By putting the fish in what appears to be a natural environment, the assertion is made that it is somehow inherently healthier than an aquarium. Unfortunately, that is an incorrect assumption. It is true that in nature the Betta lives in shallow bodies of waters, primarily rice paddies, and swamps. However, those waters represent a complete ecological system that a small vase cannot replicate. Those seemingly small rice paddies are part of a much larger body of water that dilutes toxins. Scavengers and bacteria present in the water break down wastes and render them harmless to fish living there. No closed environment can truly replicate the conditions in these natural habitats. The water volume isn't the only problem with a vase. In nature, the Betta Betta lives on a diet that consists predominantly of insects and insect larvae. Bettas are valued for their role in controlling mosquitoes in their native habitat. The Betta's digestive tract is built to digest meat, rather than vegetable material. Its upturned mouth is designed to grab insects that have fallen into the water. A diet consisting of vegetable matter may keep a Betta alive for a while, but it is neither natural nor healthy. Over time, the Betta will slowly be starved of the proper nutrients and more easily fall victim to the disease. Even if they do not fall prey to disease, the already short lifespan of the fish will very likely be shortened even further. Water temperature in the Lily-Betta combination is another problem. The primary reason a Betta in a small bowl is often listless is due to low water temperature. Bettas are accustomed to tropical climates, being native to native to countries such as Thailand, where the climate is hot and moist year round. The ideal water temperature for the Betta is about 80 degrees Fahrenheit. Without a heater, the water in a vase will be too cool for comfort most of the time. Although the Betta can survive at lower temperatures, when the water is too chilly, they become lethargic and may even refuse to eat. Although flower vases cannot be heated, with the advent of mini-heaters, small tanks, and even bowls can now be heated. If space is limited, ditch the vase and at least get a small thank that accommodates a mini-heater. Lastly, there is the issue of how the Betta breathes. Like other fish, the Betta takes in oxygen from the water. However, the Betta also has a special organ that allows it to breathe air directly from the surface of the water. This organ is what allows the Betta to live in water that has very little oxygen. Studies have shown that fish with this organ must regularly breathe some air at the surface, even if there is sufficient oxygen in the water itself. 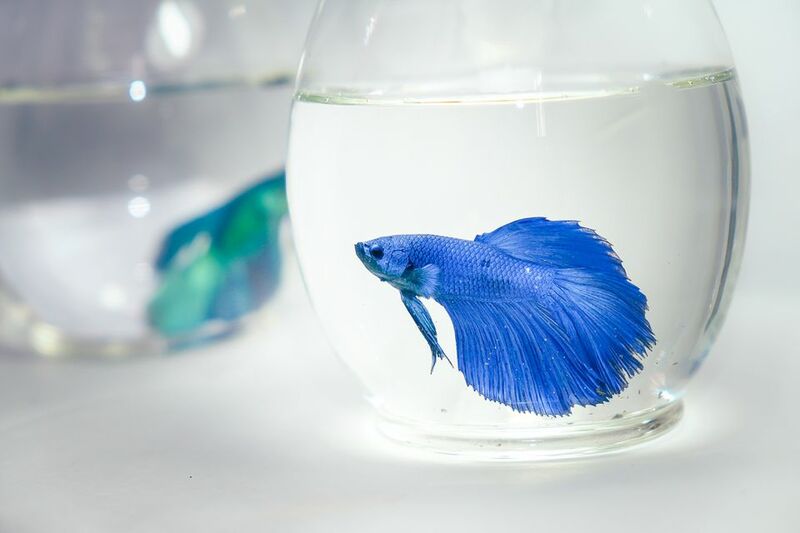 Unfortunately, for the Betta, if the Lily vase is not set up with an open space at the top of the water, the Betta may become deprived of the oxygen it needs to survive. The Peace Lily Vase-Siamese Fighting combination has persisted as a popular fad, but it is neither natural nor healthy for the fish. A dog or cat owner would not shut their pet in a small closet with minimal heat, food, and air. Should fish be treated any less humanely?